Authentic Geek! : Fan Creates 'Ghostbusters' Themed Stormtrooper Helmet or "Something Strange ..... In Your Galaxy Far, Far Away"
Fan Creates 'Ghostbusters' Themed Stormtrooper Helmet or "Something Strange ..... In Your Galaxy Far, Far Away"
The 501st TK Project is a "Star Wars" themed charity event, where fans are invited to create unique Stormtrooper helmets which will be auctioned off to support the Make-A-Wish Foundation. 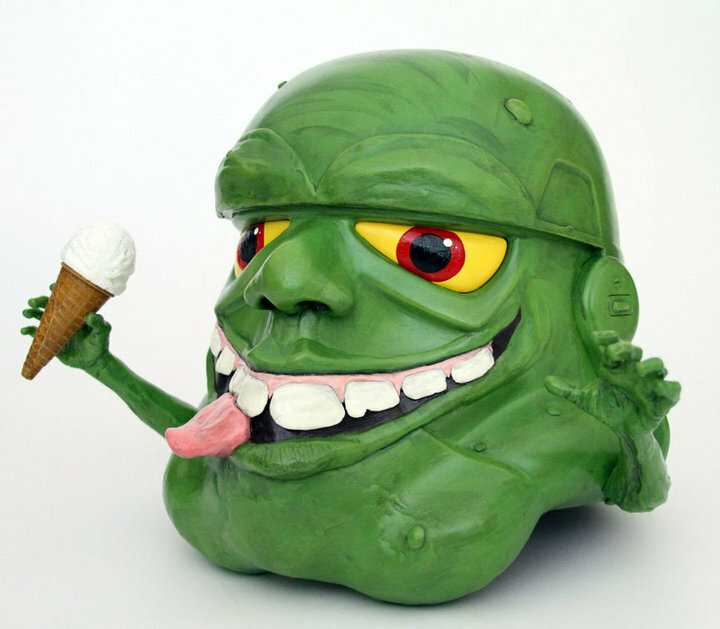 Of the many entrants, artist Nicole Falk created this "Ghostbusters" inspired helmet. Apparently, when not sliming Dr. Peter Venkman, Slimer (aka "The Onion Headed Ghost") works for Emperor Palpatine. Not sure what he does. Maybe it involves food testing? Scaring Stormtroopers? Trying to get Lord Vader to laugh?